I really like those blasts from our pasts that Facebook invites us to share. This is the labyrinth at the Franciscan Renewal Center in (of all incongruous places) Scottsdale, Arizona. Facebook reminded me that I was there for an Alban Institute training five years ago. I tend to walk labyrinths, and other paths of prayer, barefoot. It helps ground me. It slows me down. There’s a sole / soul connection. And then comes the poem’s turning point. Taking off my shoes, becoming re-grounded, is a turning point. Walking the labyrinth is an exercise in turning. The lines that follow are after the turning point of the poem. Hopkins could sense this in the 1800s. Perhaps we will too, when we take off our shoes, and turn. *Maybe this post sounds extra-familiar to you. I wrote it for Facebook on Nov. 17. It’s more a blog post than a Facebook post, though, don’t you think? For the past 2 months, I’ve walked the parishes of the Tacoma Connection: The United Methodist churches of Bethany, The Bridge, Fern Hill, First, Grace, Kalevaria, Parkland (not in that order). I walked the parish of Epworth LeSourd last. Sometimes I walked alone; sometimes with other pastors, including the pastor of the parish we were walking. Alone, the walks gave me a prayerful sense of the presence of God in the city: God’s love flowing for each neighborhood, blessing each act of community-building, grieving each sign of brokenness. Monday I walked my 5-mile route in the early morning. I think I got to the Puget Park ravine around 6:30. It was dim light. 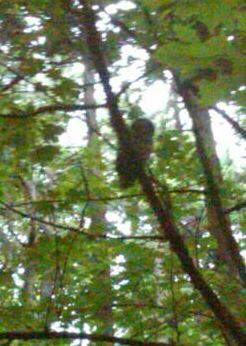 About halfway up the trail from Ruston Way to Proctor, there on a branch right over the trail, no farther than the basketball hoop is from the free-throw line, was an owl. Behind the walls & doors of the building we call the “church”, it’s sometimes harder to find church, than it is out there. Walking to church this wet Wednesday morning, church happened. Three times. First, I met up with Trevor, a dog-walking acquaintance. He and his various dogs have been part of my life for the past fifteen years; we had dog-walking in common, as I walked Pepper from youth to old age. A couple years ago, I walked Pepper a lot less, but we still talked about how he was doing. Today, Trevor sympathized with me when I told him of putting Pepper to sleep last month. It was a godly meeting. He ministered to me. Church happened. Then it was Paula, in front of her group home. I hadn’t seen Paula for quite a while, or the fellow she’s usually with. Turns out he’s in a nursing home; he was hit by a car and very seriously injured, around Christmas. We talked about arranging a ride for her to get out to see him. Church happened. As I walked onto the church parking lot, I greeted a guy with a teardrop tattoo as he cut across the lot in the other direction. When he saw I was heading for the church door, he asked “You work here?” Okay, he took the conversation to the next level, I didn’t … but it developed as it needed to. I now know his name and something of his difficult story. He knows my name, and something of this church’s character of being real, and that we’d welcome him, and that the Friday night BBQ is a good gathering. When I see him next, I think I’ll be able to call him by name. Church happened. Inside the building, church happens too. Sunday mornings, it should go without saying. But let me tell you about last Saturday morning! Last Saturday morning, the four or five families of Phoenix Housing and their overnight hosts woke up, had breakfast, and set out for the rest of their day. Church happened. Last Saturday morning, like every morning of the week, the Sunrise A.A. fellowship met for the mutual encouragement that makes a life of sobriety more possible and more graceful. They met in Wilbur Hall. They’re back to meeting in the Library now; they had relinquished that friendlier space to one of the Phoenix Housing families for the week. Church happened. Last Saturday morning, like every Saturday morning for the time being, the worshipping community of the Covenant in Light Fellowship brought in their instruments & speakers, and thirty or forty members gathered for worship in Wesley Hall. They’re the worshipping community of Agapé Homes, whose gathering space on N. Fife is damaged by a bad roofing job, and will be under construction for a few months. Church happened. Last Saturday morning, ninety or so community volunteers — including the UPS football team, students & teachers from Grant Elementary, and teams from 6th Avenue businesses — gathered in Wilbur Hall to be organized for the annual Neighborhood Cleanup. Afterward, a celebration with pizza & awards (most unusual junk found, etc. ), back in Wilbur Hall. Church happened. Last Saturday morning was far busier than most … but close to two hundred people gave and received gifts of grace in this place. Lives, and our community, were transformed. Service was performed. Relationships were built. Christ’s love was shared. Every element of Epworth LeSourd’s mission was engaged: “We boldly transform lives and our community through service, building relationships, and sharing Christ’s love.” Church happened. The crazy thing, the crazy wonderful thing, is that most of the people involved in every one of these events were NOT members of Epworth LeSourd. Even though part of me wants to bemoan the fact that none of these missional events happening here in this place were programs of Epworth LeSourd, sponsored by and controlled by our Church Council and various committees, supervised by church members. I’m guessing that on Saturday morning, there wouldn’t have been more than two or three ELUMC members involved, even as ELUMC’s mission was fully engaged, and Church happened. I wrote that last paragraph, then went back to the mission statement: “We boldly … “ and realized that “We” weren’t doing any of those great things on Saturday morning, if by “We” we mean folks on our membership & constituency rolls. But one of the things a traditional church learns as we become a missional church, is that what we mean by “we” changes. The question of who belongs, who’s part of our mission, who’s on our team, who’s “with us”, shifts. Who we mean, when we say “us”, shifts. If we’re on God’s mission, then anyone doing the work of God is part of “us”. Church happens when God’s work is engaged, no matter who’s doing it. Our mission isn’t to do it all, but to be united with all who are doing it. For over six months, my pedometer and I have been joined at the hip. Anyway, the crazy thing works. I get “Healthmiles” points for every day I walk over 7000 steps (about 3-1/2 miles). For the first month and a half of my wearing the pedometer, I didn’t change my sedentary habits. I think that during those days, I got points for a 7000-step day once! Then, I started walking to the church. I live ten blocks away, and I had been driving to work every day. My mileage increased. At the beginning of Lent, I decided that for the season, I would walk anywhere I didn’t HAVE TO drive. That included walking to Tacoma Community House, St. Joe’s Hospital, Tacoma General, First UMC … and it even included, one lovely spring day, a pastoral call at Helen Engle’s south of Fircrest, and another day, a visit to Dave Pflueger’s on North Pearl. When Lent was over, I decided that the pattern should continue. I found a five-mile loop for recreational walks, involving the McCarver/Carr hill down to Old Town, a walk along Ruston Way, and a lovely climb through the woods of Puget Park to north 31st & Proctor, then home. TWO good coffee stops along the way, if I’m wanting to be leisurely. As my miles have gone up, my weight has been slowly coming down — I’ve lost a fifteen pounds without changing my diet. My goal is to walk 7000 steps every day of the week, and to make 12,000 steps (about 6 miles) on at least five of those days. If I walk from home to Shakabrah for coffee in the morning, then from home to church twice, I’m almost there, and that doesn’t even feel incovenient. One lovely morning I started walking way early, got down onto Ruston Way and just kept going, to Point Defiance, then the park’s Outer Perimeter Trail, which basically follows the Five Mile Drive. Walking home got tiring, I’ll admit. But the walk was fifteen or sixteen miles, and the day was over eighteen. Saturday before Annual Conference, I walked the loop of all the churches in the Tacoma Connecting Mission: Epworth LeSourd, First, Grace, Kalevaria, St. Paul’s, Bethany, Fern Hill, Asbury, Sixth Avenue, and back to Epworth LeSourd. 21 or so miles. I took pictures along the way, and forwarded them to FaceBook and Flickr, until the battery in my Blackberry died. The big walks aren’t where I get my joy in walking, though. The joy comes in walking the places I used to depend on driving: to & from church, to the hospital or a meeting, and so forth. The joy comes in noticing what I used to whiz by at 35 mph, cocooned in my car. I pick up the scent of a plant, and learn what plant it is. I notice the cool and breeze a shade tree creates on a sunny midday. I hear the wind chimes gently playing at someone’s house, and the anonymous house becomes for me, someone’s home. I smell dinners cooking — barbecue, garlic & peppers, fish, curry, and am thankful for the diversity of the neighborhoods in which we live. And the joy comes especially in the human-to-human interactions that the car prevents. Walking to work a couple weeks ago, then to a meeting at First UMC, I walked something like 2-1/2 miles. In that distance, I talked with ten people, called four or five by name, made the day ten people better for me, and one person better for each of ten others. I believe small interactions make the world better. creative thinking. It shouldn’t be surprising to me how often an idea comes to me somewhere out there on the sidewalks of Tacoma. saving money! I’ve walked close to a thousand miles since January; probably half of those are miles I would have driven in the old days. Those short-distance drives I’m no longer doing are the worst for gas mileage. So I’ve probably saved three tanks of gas, or more — and the miles-per-gallon my car is now giving me has gone up into the thirties. So I walk. And as long as it’s fruitful, I’ll continue.